Banner & Message Pens There is 1 product. 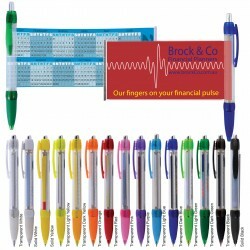 Push button action ballpoint pen with pull out custom design laminated banner and rubber grip.Same or different design available both sides. Calendar available one side.A lead time of 4 weeks applies to this product by air freight.